GenJet™ Plus DNA In Vivo Tranfection Reagent was formulated from its In Vitro transfection reagent with addition of several proprietary peptides. With new chemistry, the DNA condensing groups were significantly increased in comparison of the original formulation. A shield peptide was also linked to the backbone to prevent In Vivo environment interferences, leading to high In Vivo transfection efficiency. GenJet™ Plus was confirmed to give best renilla luciferase expression in lung, spleen, liver and kidney. 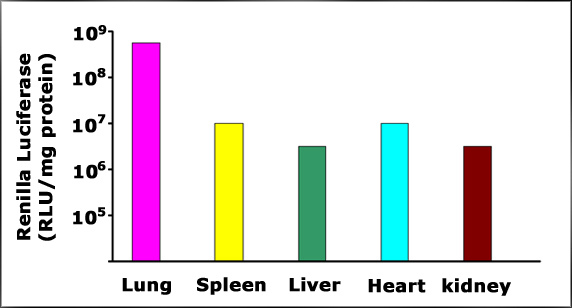 Comparison of the delivery efficiencies to different organs in mice of a plasmid containing the Renilla luciferase gene mediated by GenJet™ Plus.